Rating: Worth the 47 minute run time. Summary: The season premiere, “Blood Money” had been picked up with some of the darkest, most conflicted scenes for characters, Jesse Pinkman and Hank Schrader; however, Walter White had seemed right at home, almost. The contrast of conscious versus criminal had never been further apart. Picking up from the season cliff hanger for Season 5, we have found Hank attempting to gracefully exit Walter White’s house. Hiding out at home, Hank had moved forward with trying to reconcile the truth of his own epiphany. Despite his recent wealth, Pinkman had started a precarious decline into depression. 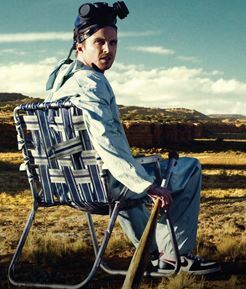 Jesse’s selfless actions had soon brought him face to face with Walt. Two key elements of this episode had been the flash forward scene revealing “Eisenberg” on the walls of the White house. The other, a moment had been best left to Walter White’s own words, “If you don’t know who I am. Then maybe your best course, would be to tread lightly.” That dialogue had been a great kick off to the final episodes. This entry was posted in Cable Television and tagged Cable Television, iTunes, Review: Breaking Bad Season Premiere "Blood Money". Bookmark the permalink.